Perennial herb from a branched, stem-base and a thick, deep taproot; stems erect, solitary to several, simple, hollow, glabrous or sparsely long-hairy, exuding milky juice when broken, 5-60 cm tall. Basal leaves lanceolate to oblanceolate, 5-40 cm long, 1-10 cm wide, entire to toothed or more often pinnately lobed to pinnately cut or toothed, tapering basally to a more or less winged stalk, glabrous or slightly hairy; stem leaves lacking. Heads with strap-shaped flowers, solitary; involucres 15-25 mm tall; involucral bracts in 2 series, the outer ones lanceolate, reflexed, glabrous, the inner ones lanceolate, long-pointed; ray flowers yellow; disk flowers lacking. Achenes 3-4 mm long, not including the beak which is 2-4 times longer than the body, straw-coloured or greenish-brown to greyish, sharply ribbed and spiny above; pappus of numerous, 6-8 mm long, white hairlike bristles. The genus Taraxacum has received widely varying treatments in North America. This is not unexpected in a group of plants in which hybridization, polyploidy, and apomixis are active. Some taxonomists (e.g., Ferris 1960, Weber 1967, Welsh 1974, Tayl. and MacBryde 1977, Douglas et al. 1989, Richards 1994, Cody 1996) recognize six or fewer native species (e.g., T. californium Munz. & Johnston, T. ceratophorum, T. eriophorum, T. lyratum, T. phymatocarpum and T. spectabile Dahlst.). Others have recognized 10 or more species (e.g., Fernald 1950, Hulten 1968, Scoggan 1979, Porsild and Cody 1980). The most conservative approach for our British Columbia species was taken by Boivin (1966-1967, 1972), Hulten (1968), Packer (1983) and Douglas (1989) who included T. eriophorum and T. lyratum within T. ceratophorum. 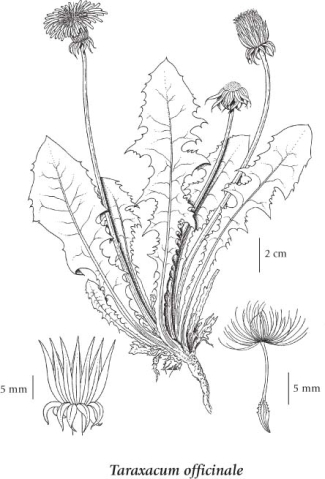 Hulten (1968), however, included 45 "microspecies" under T. ceratophorum and still recognized nine other northern Taraxacum. I have recognized only one native Taraxacum species in British Columbia for several reasons. Of all the specimens I examined, only a small number would fit the description of the few species generally recognized. The remainder, when mature, represent an amazing array of variation that is often not repeated between sheets. In addition, most of the subalpine-alpine plants never set seed before the end of the short growing season, thus a key character, the achene, is often unavailable for determination. The time spent by several energetic Scandinavian taxonomists (e.g., G.A.H. Dahlstede, G. Haglund, and A.E. Porsild), formally naming several hundred "microspecies", has not enlightened the taxonomy of the genus. Even in recent years some taxonomists persist in naming every variation they encounter (e.g., Richards 1970). Until some brave taxonomist undertakes and successfully completes a thorough modern biosystematic study it would appear that the recognition of more than a single entity is not feasible. 1. Introduced, aggressive weedy species of disturbed sites. Mesic to dry roadsides, pastures, gardens and disturbed areas; common in S BC, less frequent northward; introduced from Europe. Brouillet, Luc. 2010. Taraxacum officinale. Flora North America. Availale Online. USDA. Taraxacum officinale. United States Department of Agriculture Plants Database. Available Online.